43. The barriers to the free flow of capital among the major world capital markets include all of the following except: a. low transaction costs b. taxation policies c. foreign exchange risks d. legal restrictions ANS: A PTS: 1 OBJ: TYPE: Fact LOC: Understand the role of the finance function TOP: Market efficiency outside of the U.S.
71. Although there was a financial crisis in 2007-2010, some firms were able to weather the crisis. These firms had all of the following characteristics which were directly responsible for their ability to survive the crisis EXCEPT: a. Tight control over fixed and variable costs b. Low business risk c. A business model which encouraged risk taking by management that paid off d. Low product pricing ANS: C PTS: 1 OBJ: TYPE: Fact NAT: Reflective thinking LOC: Understand the role of the finance function in the enterprise TOP: Overview of the Financial Crisis of 2007-2010 ESSAY 1. What are the differences between the primary and secondary markets? ANS: The primary market allows the investor to purchase new securities. Net proceeds from such sales go to the issuing corporation. The secondary market allows the investor to purchase securities that are already in circulation. These are purchased through an organized security exchange, for example NYSE, or in the over-the-counter market, and none of the proceeds go to the issuing corporation. PTS: 1 OBJ: TYPE: Fact NAT: Reflective thinking LOC: Understand the role of the finance function TOP: Financial markets 2. What is the purpose and importance of the stock market indexes? ANS: Stock market indexes give a broad indication of how the stock market or a segment of it performed during a particular day. The most known index is the Dow Jones Industrial Average (DJIA), which is composed of 30 stocks. The index gives an overview of how well stocks are doing, the overall health of the economy, and the anticipated marketability of securities. PTS: 1 OBJ: TYPE: Fact NAT: Reflective thinking LOC: Understand the role of the finance function TOP: Stock market indexes 3. Explain the degrees of market efficiency and their applicability to the stock market. ANS: 1. Weak form market efficiency: No investor can earn excess returns based on historical price information or past return information. 2. Semi-strong market efficiency: No investor can earn excess returns based on an investment strategy using any public information. Stock prices consistently incorporate any new information about the stock or the issuing company. 3. Strong market efficiency: No investor can consistently earn excess returns based on any public or private information. Stock prices reflect all information, both public and private. The number of investors who have traded with insider knowledge provides graphic evidence that the strong form efficiency does not hold. PTS: 1 OBJ: TYPE: Fact NAT: Reflective thinking LOC: Understand the role of the finance function TOP: Market efficiency 4. Define the differences between the capital market and the money market. Give examples of the kinds of securities found in each category. ANS: Money market securities are short-term and liquid with maturities under one year. There is minimal risk in the money market and money market securities generally pay interest that is guaranteed. Types of money market securities are: cash and cash equivalents, commercial paper, treasury bills, government securities, and certificates of deposit. Capital market securities are long-term and illiquid with maturities greater than one year. There is significant risk involved and capital market securities earn a rate of return that is not guaranteed. Types of capital market securities are: preferred stocks, common stocks and bonds. 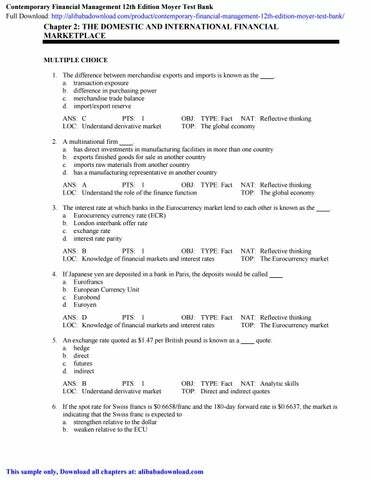 PTS: 1 OBJ: TYPE: Fact NAT: Reflective thinking LOC: Understand the role of the finance function TOP: Financial markets 5. List the types of disclosure forms required by the SEC and explain what information is contained in each form.